Elite Thoroughbreds syndicated galloper Testashadow – winner of seven races that includes the Magic Millions Cup found this colt at the Inglis Classic Yearling sale and are pleased to be offering shares in the bay. Testashadow has won more than $1.2 million in earnings for his connections, is a rising six-year-old, and Elite Thoroughbreds believe the bay has plenty to offer his syndicate of owners. This colt is out of the speedy War Flower, an on debut maiden winner by five-and-a-half lengths. War Flower is out of the Centaine mare, Boganvillia a sister to the Listed winner La Rose Noir in-turn the dam of the black type winner Espurante (by Flying Spur) the dam of promising VRC 2016 Listed Desirable Stakes winner, Jennifer Lynn (by High Chaparral). This female family has plenty going for it with the Group 2 Tranquil Star Stakes winner Legless Veuve (by Pins) appearing too. By Testa Rossa a talented racehorse that won on debut with the bay winning his next three starts in as many outings. At the completion of Testa Rossa’s career the son of Perugino’s race-record showed 13 wins and three placings from just 28 racetrack appearances banking connections $3,042,167. NOT ENOUGH? War Flower is by the American Grade 1 Champagne Stakes winner, War Pass (by Cherokee Run) sire of nine stakes winners from 172 runners, of those 127 are winners including Grade 1 2013 Keeneland Blue Grass Stakes winner, Java’s War. The horses best performer in Australia is the Group 3 winner, Galaxy Pegasus. This colt is War Flower’s first foal, with the brown mare gaving birth to a filly last spring and was covered again by Testa Rossa. 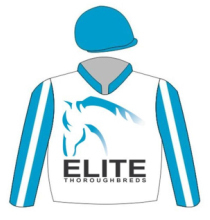 Once the syndicate has been formed it will be managed by Elite Thoroughbreds. Portelli’s first Group One winner came in 2007 with the success of Rena’s Lady in the AJC Oaks, a second elite win was delivered by Gold Trail in 2010 in New Zealand’s premier sprint, the Group One Railway Stakes at Ellerslie, his third was with Rebel Danein the Sir Rupert Clark Stakes at Caulfield during the spring of 2013. Rebel Dane a tough stallion, remained in training and delivered his connections and Portelli with another Group 1 when the bay son of California Dane won a thrid Group 1 in the MVRC’s Manikato Stakes denying Fell Swoop and Japonisme. The most recent victory for Portelli at the highest level was a fairy-tale win when he won the 2017 ATC $3.5million Group 1 Golden Slipper (1200 m.) with She Will Reign. One of the measures of Portelli’s abilities is his success in training for syndicates. His association with Elite Thoroughbreds has realised a steady flow of winners including Testashadow (seven wins & more than $1.23 million in earnings), Sebring Sun, Cosmic Cameo, Next Level, Seeking Asylum, Miss Spoken – and the retired Group 3 winner I’m All The Talk (Stratum – Weekend Gossip) that is now standing at Mungrup Stud in Western Australia. Portelli signed off the 2015-16 racing season with his runners returning more than $1.6million to connections on the back of $1.64million earned during 2014-15 season. With two months to go until the conclusion of the 2016-17 season Portelli’s stable earnings now stand at $3.3million, with 14-metropolitan winners – Portelli happily shares whatever credit comes his way. The share price is inclusive of the breaking-in fee, 100 days spelling expenses at GT Park / Jazzcom, 45-days pre-training; the 2018 Inglis race series. In addition, the Insurance policy is paid until January 1st, 2018. The share price also includes the Golden Slipper and Golden Rose nomination fees as well as all related registration fee with Racing Australia’s Registrar of Racehorses. The ongoing upkeep fee for a 2.5% share in this colt is $110.00 (inc. GST) commencing July 1st, 2017.